As the Thanksgiving holiday approaches here in the United States, I find myself reflecting with gratitude on my Bikram Yoga practice, the release and peace it gives me, and the numerous health and mental benefits it provides. In addition, I am so grateful that I can share my practice with all of you through Hot Off the Mat. 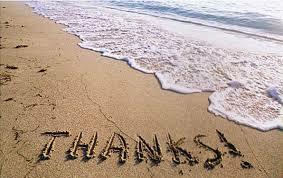 Thank you for reading and for sharing in my Bikram Yoga community! My best wishes to all of you for a great holiday! Improved health and stamina: When I started practicing 5 years ago, I was always exhausted. My life wore me out. Now I have the energy to not only tackle my day, but to enjoy it. Arm muscles: Not that they are huge, mind you, but I never had a stitch of muscle on my stick figure arms. Now when I flex, I can see my biceps. More peaceful sleep: For years, I awoke every night at 3 am and tossed and turned while my mind raced. Now I sleep through the night. Yoga breathing: I use my yoga breathing to calm myself both on and off the mat. It gives me confidence in what were previously nerve-wracking situations for me, like public speaking. Clearer skin: It is true what they say; clearer pores help my skin look healthier and younger. A little heat in the cold of winter: I hate the cold, so the heat of the studio keeps me going during these tough winter months. All my readers at Hot Off the Mat: My blog is only a few months old, but I am already so grateful for the wonderful community it is creating. Thank you to all my readers for sharing their experiences and wisdom with me. Fellow yogis, what are you most grateful for in your practice? ← Catfight in Bikram Yoga Class!?! I concur fully! This practice is incredibly powerful. Little did I know when I started 3 1/2 years ago…amazing! I’m thankful for discovering Bikram yoga in the first place and having a great studio to practice at on just about a daily basis. Thank you for your comment. It is great to connect with other Bikram yogis!